It is officially scooter season. My car has sat in the driveway all week long. In fact one evening, as I zipped down my street, I looked at my driveway and thought "Who's parked in my driveway?!? Oh, Wait! That's my car". Listen, I get up at 5:20 AM. My brain shuts off somewhere around 3:00 PM. Any hoo...Scooter Season! It. Is. Here! Monday night I rode the scooter over to meet someone for dinner at Bela Napoli's. I parked the V all alone at the curb but when we came out of the restaurant there were two little Honda scooters parked next to mine. It was like my Vespa was a mogwai and someone had spilled water on it. Then we walked around the Brookside neighborhood because the weather was so dang nice. As we walked I kept noticing all the scooters zipping around. Every time I spotted one I'd stop and say "oh! look at that one!". I'm sure I was really annoying. There were not a lot of scooters in OKC when Chris and I were there. Things may be different there now. 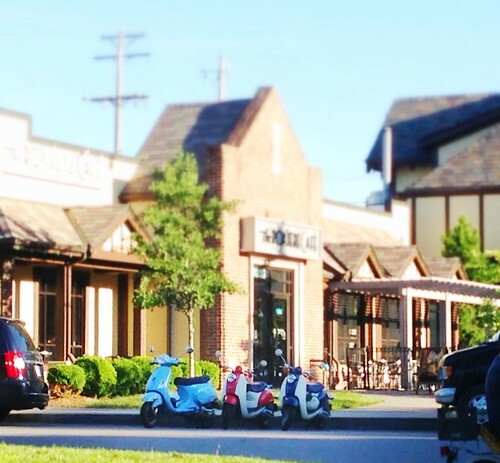 I mean they do have a Whole Foods, so maybe that also means more scooters on the road. I don't know, but when I still lived there, seeing a scooter was a novelty. It was like seeing that perfectly restored rust-free VW van or a unicorn. I see scooters all the time here. They are everywhere. I'll be walking on the treadmill and my gaze will travel over to the window. It never fails. I'll see at least one scooter ride by in the measly thirty minutes I'm on that treadmill. On the days when the weather was not so great and I chose to take the car, I'd feel really weak when I'd see someone ride by on their scooter. Of course they were all bundled up and looked a little miserable, but still. If they could do it, I could do it. Every time I see a scooter my heart gives a little jump. You know how the shine wears off a new penny or kids out grow that one favorite toy? I thought that this would eventually happen with the scooter. I thought that one day I'd just be riding the scooter because it was economical. Really if I wanted to be more economical, I'd get a good bicycle. Nope. I ride the scooter for the sheer joy of riding the scooter. Sometimes I will make up errands just to have an excuse to take a round about way home, extending my scooter ride. There's often a tune playing in my head (mostly it's Pomplamoose's cover of All the Single Ladies) and I'll bob my head along to that tune. I still manage to turn a few heads as I drive down the street. All of it still makes me smile. It's like getting on my yoga mat. It brings so much joy. I love Scooter Season.